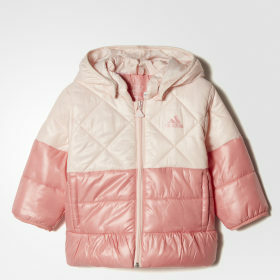 Keep your little ones adventuring this winter with kid’s winter jackets from adidas. Classic adidas style, with warming down compartments and water-resistant fabrics offering the best protection from the elements. Our children’s winter jackets come in a complete range of sizes from infants 0-3 months all the way up to 15-16-year olds. Our full-size range helps you get a jacket that will fit perfectly. adidas materials and quality mean our jackets will stand up to all the rigours of childhood – from days out in the snow to muddy adventures in the winter rain. From classic Trefoil designs to modern puffer styles, our range of girl’s winter jackets will keep your kids out and about this winter. The lightweight warmth of down insulation combined with long sleeves, deep, cosy hoods and full zip and button designs provide the perfect blend of comfort and practicality. Choose from a striking range of colours including black, blue, red and pink and a full range of sizing from 0-3 months to 15-16 years. adidas boy’s style and quality combine to bring you a range of tough, durable winter jackets designed to outlast the toughest winter adventures. Including puffer designs, trefoil down jackets and outdoor jackets to keep your young man comfortable as he explores and gets dirty this winter. Available in a full range of sizes from 0-3 months to 15-16 years and with classic adidas colours, our boys winter jackets are the perfect street fashion accessory. 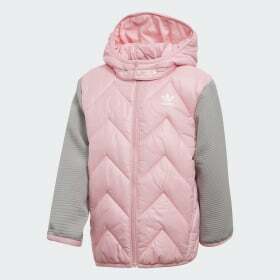 Don’t let the adventures stop this winter with adidas kid’s winter jackets keeping out the cold with classic street style.